The underdeck is the cavity right below an elevated patio or second-story terrace. This area tends to be largely ignored, when in reality, it can be used as a part of your yard. With a bit of know-how and design ideas, you can take advantage of this space and make it the perfect summer relaxation spot. 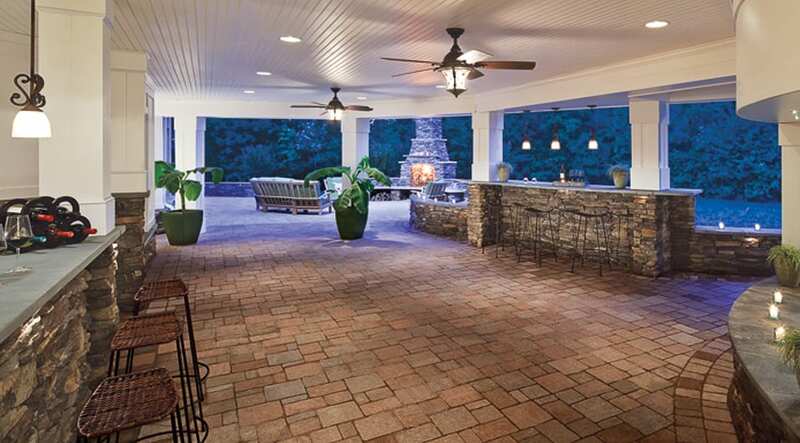 So, you’re intrigued by the idea of turning your underdeck into your favorite outdoor spot. Now you’re looking for some advice. Below, we will discuss a few different things to consider. You can use the underdeck area as an addition to your pool’s aesthetic. Amp up the comfort level by installing ceiling fans, giving the underdeck area an almost homely feel. Add a mini bar, and the underdeck has now transformed into a spot where you can relax, enjoy a summer cocktail, and unwind. Alternatively, you can use the underdeck as an extension of your living room. Place hardscape like brick or natural stone to designate the area as a place where you can relax. Make the underdeck area versatile with a neutral color scheme, using a screen to make it your preferred spot separate to the rest of your home’s infrastructure or backyard. You can use a traditional privacy screen, or a natural screen that uses plants. Like anywhere else in the upper Midwest, Minnesotans will experience summer rains. Once the storm rolls through, your underdeck ceases to be relaxing. Here are several ways that you can waterproof the area. Use specialty membranes secured to joists to catch the water. These spaces will then divert the water into a downspout and gutter, allowing the underdeck to stay relatively dry during a downpour. You can also use an underdeck ceiling system with panels designed to catch the water and channel it away. These systems tend to look just like a regular canopy, with the perimeter frame and spacers angled away from the house to carry the runoff. There is nothing more relaxing than sitting in a hot tub and allowing the warm water release the pent-up tension in your body. Placing the hot tub in the underdeck area will allow you to soak – rain or shine. Before you install a hot tub, there are certain factors that you need to consider. For a hot tub for personal relaxation, you will find that a smaller tub will be appropriate. Not only will a smaller hot tub be suitable for personal pleasure, but it won’t cause stress on the underdeck’s foundation. Always make sure to purchase a hot tub from a reputable dealer or designer – do not buy a hot tub from open fairs or carnivals. These avenues are more interested in cash flow, sometimes selling compromised hot tubs just to make money. Naturally, you want comfortable furniture in your underdeck. However, outdoor furniture can be expensive and become damaged if subjected to rain and sleet. Being cognizant of the materials used on the outdoor furniture will ensure that it is long-lasting. Choose durable wood like teak. Teak has the potential to last for several generations, as it is naturally resistant to rain, snow, and insect damage. It will last even longer if washed and prepped regularly. For the cushions in your relaxation spot, choose weather resistant cushions that have a high UV rating. Homeowners are aware of the damage that rain can do to their personal properties, but they tend to overlook the damaging effects of the sun, not realizing that the furniture will sit under direct sunlight on a daily and yearly basis. This exposure can cause resins and colors to fade. During the colder seasons, remove cushions and store them indoors. You can also use covers to shield furniture. These ideas will guarantee that your underdeck area stays safe, quiet, and your designated quiet spot. The outdoors gives you the opportunity to feel inspired, and now it can be your space where you can unwind during the warm summer months.